There are few concealed carry handguns as iconic as the Walther PPK. As the weapon of choice for a certain British super agent, you’d think that its quality would suffer as a result of its fame. Fortunately, the PPK is a great handgun in its own right, but what is the best Walther PPK holster for carrying this little gem? After testing several great PPK holsters, our top pick holster is the Barsony 6 Position Ambidextrous Concealment Pancake Holster because of its comfort and the fact that it’s made of a beautiful tan leather. Also, this model has good overall retention and attaches firmly to your pants. In fact, the clip is even fully adjustable so that you can have your own preferred fit. Our top choice Walther PPK holster is the Barsony 6, which is designed to attach to your belt. As an OWB holster, it has a unique pancake styling that allows it to feel comfortable during casual wear. This holster is crafted out of Cordura nylon, which is a ballistic-grade nylon that won’t deform or tear. The trigger coverage is fairly complete; it’s very hard to accidentally fire with this holster. This is an ambidextrous holster; simply reverse its body and loop it through your belt on the opposite side. Since it has a pancake design, this holster is fairly easy to conceal since its body conforms with yours. The retention strap is fully adjustable and the thumb-break is reversible as well. Unfortunately, it’s hard to get a good combat grip with this holster due to its positioning. While it is ambidextrous, this isn’t a great crossdraw holster. The way that it seats on the belt just doesn’t feel right unless you are drawing it forward-style. The snap can be somewhat hard to release. Not sure if the Barsony is right for you? Here are some things you should consider when holster shopping for your PPK. The PPK is actually a fairly underrated firearm. Despite this, most agree that the PPK is one of the quintessential conceal carry guns of the last 50 years. In fact, it has even inspired many of the models out there, but what’s the best way to choose a good holster? As a classic concealed carry handgun, the Walther PPK has quite a few great options when it comes to holstering the firearm. Classic Leather: Some PPK owners prefer a classic style holster that blends in well with the all-wood grip of the standard PPK. While this all-wood feature isn’t available on the PPK-S, the wood notes of either PPK weapon really work well with a nice tan or brown leather holster. These classic holsters have a lot of strength and durability so that you can use them for years if not decades. Just remember that the quality of the leather is going to really depend on the hide selected. Nylon: For many years, there was a stigma against nylon holsters. They were viewed as inferior to leather holsters because of their stitched construction. Today, there are several ballistic-grade nylon stitches like Cordura that will stand the test of time. If you are planning on purchasing a good nylon holster, the models that you select should all have a strong construction so that the pistol isn’t accidentally actuated. Synthetic: Synthetic holsters are gaining in popularity. These holsters look good, are solid in construction, and also have less of a tendency to crack and scratch than leather holsters. One of the best types out there is Kydex. Synthetics also tend to have a great retention and have a tendency to not allow for accidental discharge. The absolute key takeaway for your holster is that it should be designed to not let you accidentally discharge your weapon. You should never be able to slide an object inside the holster and accidentally pull the trigger. For a great video about holsters and what to avoid, check out Bizcuits N Guns Youtube entry. Shoulder or Underarm Holster: We’ve all seen the classic police dramas where the gun is stored in one of these holsters. A shoulder holster is a good option for those who prefer not to wear their handguns at their waists. While these are only concealable with a jacket, these holsters provide quick draw functionality. While you’ll be primarily drawing in a crossdraw fashion, these are fairly easy to use. Just remember that the PPK will always be facing to your back while it is concealed and ensure that your holster includes a thumb-break snap so that your gun isn’t shaken loose. IWB: The in-waistband type of gun holster fits atop your belt or pants and goes on the inside. 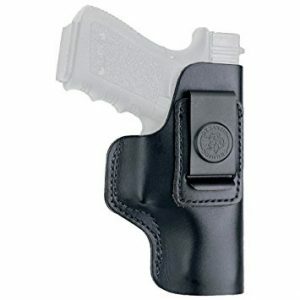 This places the holster up against your body, so comfort is a major consideration with this type of holster. Also, with an IWB-type holster, you will need to purchase larger pants that can accommodate the extra bulkiness of your gun and holster. OWB: The outside-of-waistband models of holster allow for you to conceal your weapon at your hip. While these are a little more visible than the IWB-types, you shouldn’t be able to see the weapon if you’re wearing a jacket. Still, if there was a holster-type that was most visible, this would probably be it. Pocket: There are holsters on the market that are designed to fit neatly into your pocket. This is a pretty good option if you want a relatively low-profile concealment method. Also, a smaller gun like a Walther PPK is fairly easy to fit inside of a pocket. Effective trigger protection is absolutely imperative here; you don’t want to accidentally discharge your weapon because of a loose pen or another object. Also, a good pocket holster should also have a shaping that helps hide the outline of your Walther PPK. Ankle Holsters: As you might expect, these types of holsters fit neatly around your ankle. It’s important to choose the right ankle holster because some are downright painful to wear while walking. It should have adequate padding and a wearable form factor. Also, it’s important to remember that if you are fighting for your safety, it might be hard to crouch down and retrieve your gun from around your ankle. Leather is a great material for the PPK because of its classic styling. Desantis specializes in creating quality hides for their holsters and the Insider works well for a Walther PPK. As an IWB holster, this is a fairly effective method of PPK concealment. There’s not a lot of extra bells and whistles with this holster, which is great because there’s no edges or pockets that can cause a snag. This holster has some great trigger protection and a high degree of retention. The Clip is very strong; it shouldn’t deform or bend over time with your daily use. The belt clip is fairly hard. This means that you can accidentally scratch your PPK when putting it in the holster. The clip is painted black, which means that if it were to scratch, it would be very unsightly. The leather can be a bit stiff, which means that you will have to break it in so that it fits your PPK perfectly. While this Outbags holster isn’t made of Cordura nylon, it does use a relatively strong 600 denier nylon material to provide a durable performance. The clip on this holster is comprised of steel. This is a very strong clip that you can depend on for years. The thumb-break is adjustable for the gun, which provides a high level of versatility; you can definitely use this for other weapons than your Walther PPK. The thumb-break is also very secure. 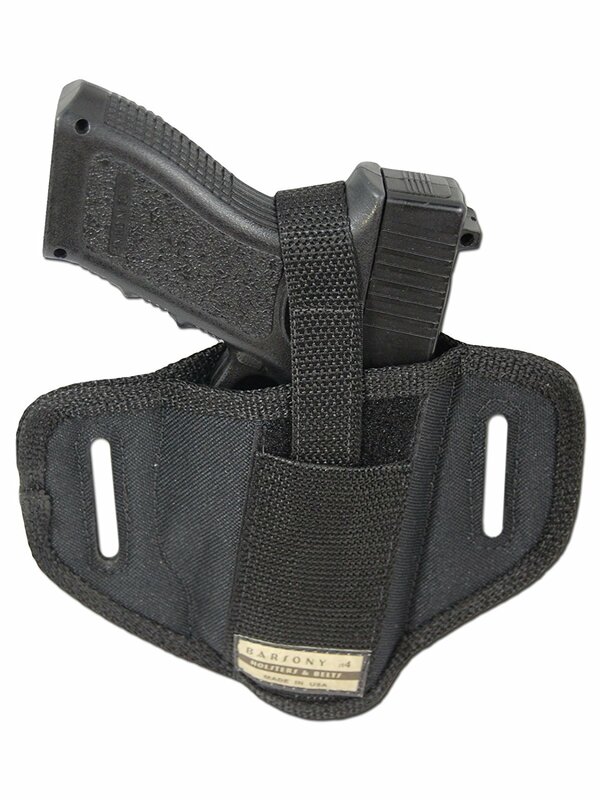 There is complete trigger coverage with this over-the-waistband holster. Accidental firings should be near-impossible. It also comes with a magazine pouch for reloading purposes. It also has a belt loop. Some buyers may prefer a more durable material than the 600 denier nylon that this is constructed out of. It’s hard to get the clip over a waistband because it’s made of steel. Conversely, because of this, you know that it’ll sit tight. 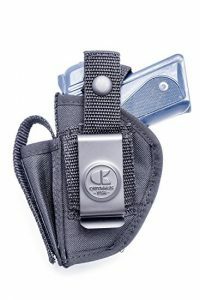 With the extra magazine pouch, this isn’t the thinnest holster for concealed carry out there. It’s somewhat bulky. 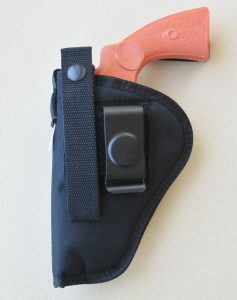 This is yet another holster that has a magazine pouch. The Federal Holsterworks PPK holster is a nylon-designed product that is very strong and ambidextrous for any type of use. As an ambidextrous model, this holster is good for strongside drawing or crossdrawing. Also, it has a good overall design that works well for righties and lefties. As a model with a magazine pouch, this has a lot of overall versatility. The thumb-break strap is reinforced for strength. As well as a clip, it also has a belt loop for ease of placement. It rides so well on your hip that you might forget that it’s there. It even is very light- the whole holster only weighs 1.6 ounces. The clip is a bit on the small side. This means that it can jostle when you move. It clips a little too tight, which can make it hard to remove at the end of the day. It is designed a bit too wide for great concealment in casual wear. The padding has a tendency to stick somewhat. The best holster for a Walther PPK is difficult to find considering the history of the gun. That being said, the selections that we have outlined above will definitely work well for most concealed carriers. Each holster selected on this list is durable, has a relatively easy draw system, is good for concealment, and will fit comfortably on your body. If we had to select a model that works best out of our alternatives, our top pick, in this case, would be the Barsony 6. This holster is ambidextrous, has a strong Cordura nylon construction, and has a form factor that provides a high degree of concealment, especially considering that this is an OWB holster. On top of this, if worn correctly, this is a very comfortable holster for your Walther PPK.